Corey Brooks says the first thing he’s going to do when he gets home later today is take a hot shower and shave. Then he’s going to see a movie with family and friends. 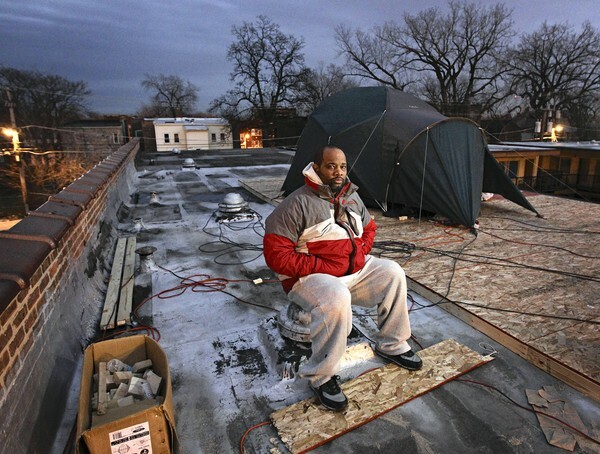 The shower and shave make all the sense in the world because Corey, a pastor on Chicago’s south side, has been on the roof of an abandoned hotel in his neighborhood since November. November 22nd, precisely. That’s 94 days of a Chicago winter (admittedly mild by our standards, thankfully) with only a tent for shelter and kerosene and electric heaters for warmth. Something tells me that Corey’s shower later today is going to be a long one. You might expect that Corey has a reason for spending most of the winter on a rooftop, and you’d be right. He has a good one. He’s been trying to draw attention to the gun violence that is a blight on his neighborhood, and so many others. The abandoned hotel has served for years as a haven for drug users and sellers, but no one wanted to develop the property. Corey wanted to buy the hotel, tear it down, and build a community center, but he didn’t have the funds to do it. 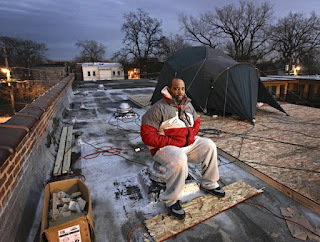 So he came up with the idea of camping on the roof until the money came in. This morning, Corey was was about $85,000 short of the $450,000 he needed for the purchase. But actor Tyler Perry, being interviewed this morning on the radio about his new movie, promised to donate $98,000, putting Corey over the top. That’s why he’s going to a movie tonight. Tyler Perry’s new movie. Corey reminds me a little of the some of the Old Testament prophets, like Ezekiel and Hosea, doing seemingly strange things, symbolic acts, to proclaim the word of the Lord. Hosea married an unfaithful wife. Ezekiel laid on his side and cooked his meals over a fire built with, well, what was left over after a cow’s meal. I can see one of those guys nodding in approval at Corey’s lonely, cold vigil on the top of a building where suffering, violence, and crime concentrate, at him literally rising above all that proclaim the word of the Lord that there is hope - that wherever God’s people are, there’s hope. But he also reminds me of Jesus, giving up home and comfort to take up residence in a broken place as a witness to hope and redemption and resurrection. Genuinely following the one who had nowhere to lay his head. The one who left home and family to live as an itinerant preacher among people who didn’t understand him and who would eventually put him to death. The one who left his Father, poured himself out, and took on humanity and servanthood. Like Jesus, like the prophets, Corey realized that the word of God didn’t mean much if he wouldn’t live in it, camp on it, follow it out of comfortable places and into uncertainty and even suffering. How Beautiful...is the body of Christ. It’s about us who wear his name, who are called to walk in his footsteps and serve people and offer tangible reminders of his broken body and spilled blood and rush to proclaim the good news that King Jesus loves human beings and has risen above the suffering and despair of a broken world. Was raised up above that suffering and despair, in fact, on a cross, but was raised and lifted up by his Father once, and for all. Being the body of Christ in the end, isn’t really about what we do on Sundays. It’s about seeing the hurt and pain and violence and sin in our world with clarity, and yet not being beaten down or jaded or corrupted by it. It’s about living among the twisted, suffering, dying victims of Satan’s carnage without blinking or retreating or insulating ourselves, and proclaiming with our words and actions the hope and good news of the gospel. We don’t move to a safer neighborhood, or barricade ourselves in our expensive houses and church buildings, or give up all hope and long for the good old days. We stand up, and we look Satan in the eye, and we laugh at his posturing and we call on the name of Jesus. And then we follow him in offering ourselves as channels of God’s blessing, agents of his redemption, ministers of reconciliation. We have good news that needs to be proclaimed from the rooftops, so let’s not back down from that calling. Let’s pitch our tents on the gospel, find our shelter in his promises. Then let’s follow him out into our world to confront evil and preach hope and proclaim the name of Jesus.